Many patients with dentures have been unhappy, if not miserable, about the quality of life it brings them. Their chewing capacity is cut in half, the dentures slip and sometimes fall out at embarrassing times, they develop sores in their mouth. Even worse, their jawbone begins to shrink, because without teeth roots in their jaw, their body begins to reabsorb the minerals in the bone to re-distribute throughout the body. All of these things are preventable with dental implants, but some patients are afraid they can’t afford them. Because everyone’s situation is different, we offer a special type of affordable dental implants. When people think of dental implants, they sometimes think it means getting one implant for each tooth. This is the “Cadillac” of dental implant services. Though fantastic in making you feel like you have your own natural teeth back, you have other options. The next option would be to get implant overdentures. You can click here to learn more about that option. However, even overdentures might be too much of a financial strain for some patients. For that reason, we offer a third, more affordable option— snap on dentures. 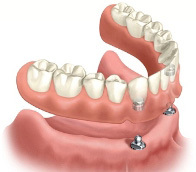 The cost of a dental implant procedure is determined by the number of implants you have placed. The more implants, the higher the cost. With a snap on denture, you’ll only have to use two implants. This cuts down on the cost significantly, while still solving a lot of the problems that come with dentures. Then, if you decide to, you could have more implants put in at a later time when you’ve had time to save. When people try to save money, they often look for the cheapest dentist around. That is dangerous. Implantology is an advanced field that requires extensive training. There can be many complications, and dental implant failure is a very real possibility. Unfortunately, you may not even find out it’s a failed procedure until years pass. Implants can become loose, infected, or even fall out. What you thought would save you money could end up costing you a fortune, if you go to a dentist who is inexperienced or uses faulty fixtures in order to save money. You want a dentist that has the right training and successful experience. Dr. Rothwell is a fellow at the International Congress of Oral Implantologists. That means she has the training and demonstrated a significant amount of successful treatments. You’ll be in safe hands.